The 2012–13 Segunda División season (known as the Liga Adelante for sponsorship reasons) was the 82nd since its establishment. The season started on 17 August 2012 and the league phase of 42 rounds ended on 9 June 2013. The entire season ended on 22 June 2013 with the promotion play-off finals. A total of 22 teams contested the league, including 15 sides from the 2011–12 season, four promoted from the 2011–12 Segunda División B and three relegated from 2011–12 La Liga. Villarreal CF, Sporting de Gijón and Racing de Santander were the teams which were relegated from La Liga the previous season. Villarreal was relegated after 12 years in La Liga, Sporting de Gijón returned to the Segunda División after a four-year tenure in La Liga, while Racing de Santander ended ten consecutive seasons in La Liga, the longest period in its history. Deportivo de La Coruña was promoted the previous season and made their immediate return to the top level, Celta de Vigo after five years in the Segunda División, and the other team promoted to La Liga as play-off winner was Valladolid after two years of absence. The teams relegated the previous season were Villarreal B, Gimnàstic de Tarragona, Alcoyano and Cartagena. These four were replaced by four Segunda División B teams: Real Madrid Castilla (group 1 champions and 2ªB champions), Mirandés (group 2 champions and 2ªB runners-up) and the winners of third round play-offs Ponferradina and Lugo. Ponferradina made an immediate return to the second level, while Real Madrid Castilla and Lugo returned to it respectively after 5 and 19 years. Finally, Mirandés made their debut in the second level. Villarreal B did not finish in the relegation places, but Villareal were relegated from Liga BBVA, and the rule of Spain is that two teams of the same owner cannot play in the same league, forcing Villarreal B's relegation. 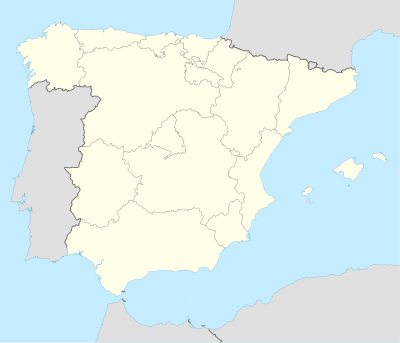 ^ Guadalajara were relegated to the Segunda División B by the LFP. Guadalajara had appealed the decision, but LFP confirmed the sanction. CEDD also confirmed the relegation. ^ Xerez were relegated to the Tercera División on 1 August  after enduring serious financial difficulties for several years. This promotion phase (known as Promoción de ascenso) was to determine the third team which was promoted to 2013–14 La Liga. Teams placed between 3rd and 6th position (excluding reserve teams) took part in the promotion play-offs. Fifth placed faced against the fourth, while the sixth positioned team faced against the third. The first leg of the semi-finals was played on 12 June, the best positioned team was played at home the second leg on 16 June. The final was also be two-legged, with the first leg on 19 June and the second leg on 23 June, with the best positioned team also playing at home the second leg. Girona and Almería played the final phase, where Almería was winner and promoted to La Liga after a two-year absence. Alcorcón and Las Palmas were eliminated in semi-finals. to the goalkeeper with least goals-to-games ratio. This award is given annually since 1999 to the team with the best fair play during the season. This ranking takes into account aspects such as cards, suspension of matches, audience behaviour and other penalties. This section not only aims to know this aspect, but also serves to break the tie in teams that are tied in all the other rules: points, head-to-head, goal difference and goals scored. ^ a b "Circular 5: normativa reguladora de los campeonatos nacionales (pages 13-14)" (in Spanish). RFEF. 20 July 2012. Archived from the original on 19 October 2012. Retrieved 15 September 2012. ^ "La Liga comienza el 19 de agosto" [La Liga starts on 19 August]. LFP. 29 May 2012. Archived from the original on 4 September 2012. Retrieved 29 May 2012. ^ a b sobre Camisetas, Todo. "After Li-Ning bankruptcy, Las Palmas and Recreativo passing to Hummel". Retrieved 18 July 2012. ^ "Álvaro Cervera no seguirá en el Racing de Santander" [Álvaro Cervera won't follow in Racing de Santander] (in Spanish). Goal.com. 12 May 2012. Retrieved 26 May 2012. ^ "Juan Carlos Unzué, presentado como ilusionante entrenador del Racing" [Juan Carlos Unzué, presented as exciting coach of Racing] (in Spanish). Racing de Santander. 19 June 2012. Retrieved 20 June 2012. ^ "Lotina s'acomiada del Villarreal" [Lotina says Goodbye to Villarreal] (in Catalan). Villarreal CF. 16 May 2012. Archived from the original on 19 September 2012. Retrieved 26 May 2012. ^ "Preciado ya es el nuevo entrenador del Villarreal" [Preciado is the new coach of Villarreal] (in Spanish). Marca. 6 June 2012. Retrieved 6 June 2012. ^ a b "Javier Clemente concluye su relación con el Sporting; le sustituye Manolo Sánchez" [Javier Clemente concludes relationship with Sporting; Manolo Sánchez replaces him] (in Spanish). Sporting de Gijón. 17 May 2012. Retrieved 26 May 2012. ^ "Manolo Preciado passes away". Marca. 7 June 2012. Retrieved 7 June 2012. ^ "Julio Velázquez dirigirà al Villarreal la pròxima temporada" [Julio Velázquez will manage Villarreal for next season] (in Catalan). Villarreal CF. 14 June 2012. Retrieved 14 June 2012. ^ "Rodriguez, grateful". LFP. 8 June 2012. Retrieved 8 June 2012. ^ "Sergio Lobera, nuevo entrenador de la UD Las Palmas" [Sergio Lobera, new manager of UD Las Palmas] (in Spanish). UD Las Palmas. 17 June 2012. Archived from the original on 19 June 2012. Retrieved 17 June 2012. ^ a b "Xavi Gracia, nuevo entrenador del Almería" [Xavi Gracia, new manager for Almería] (in Spanish). UD Almería. 12 June 2012. Archived from the original on 16 June 2012. Retrieved 14 June 2012. ^ a b "Fran Escribá, nuevo técnico del Elche CF" [Fran Escribá, new manager for Elche CF] (in Spanish). Elche CF. 12 June 2012. Archived from the original on 17 June 2012. Retrieved 14 June 2012. ^ a b "Jémez deja el Córdoba y Rafael Berges toma el mando" [Jémez departs Córdoba and Rafael Berges takes over] (in Spanish). Diario AS. 13 June 2012. Retrieved 14 June 2012. ^ a b "Fabri ya es el nuevo entrenador del Huesca" [Fabri is already the new coach of Huesca] (in Spanish). Marca. 16 June 2012. Retrieved 17 June 2012. ^ "El Murcia anuncia la salida de Iñaki Alonso como entrenador" [Murcia announces the departure of coach Iñaki Alonso] (in Spanish). Diario AS. 19 June 2012. Retrieved 20 June 2012. ^ "El nuevo entrenador del Real Murcia CF es Gustavo Siviero" [The new manager of Real Murcia CF is Gustavo Siviero] (in Spanish). Real Murcia. 4 July 2012. Archived from the original on 13 February 2013. Retrieved 4 July 2012. ^ "Emotiva despedida de Juan Antonio Anquela" [Emotional farewell to Juan Antonio Anquela] (in Spanish). AD Alcorcón. 19 June 2012. Archived from the original on 22 June 2012. Retrieved 23 June 2012. ^ "José Bordalás, nuevo entrenador de la A.D. Alcorcón" [José Bordalás, new manager of A.D. Alcorcón] (in Spanish). AD Alcorcón. 26 June 2012. Archived from the original on 30 June 2012. Retrieved 27 June 2012. ^ "Esteban Vigo y Rondán serán técnico y director deportivo" [Esteban Vigo and Rondán will be manager and general manager] (in Spanish). Diario AS. 4 July 2012. Retrieved 7 July 2012. ^ "Fabri deja el Huesca a petición propia por problemas personales" [Fabri leaves Huesca at its request for personal problems] (in Spanish). ABC. 7 August 2012. Retrieved 8 August 2012. ^ "Antonio Calderón, nuevo entrenador de la SD Huesca" [Antonio Calderón, new manager of SD Huesca] (in Spanish). Diario AS. 8 August 2012. Retrieved 8 August 2012. ^ "Juan Carlos Unzué no entrenará al Racing la temporada 2012/13" [Juan Carlos Unzué will not coach Racing in the 2012–13 season] (in Spanish). Racing de Santander. 13 August 2012. Retrieved 20 August 2012. ^ "Fabri, centrado en trabajar por el ascenso" [Fabri, focused on working for the promotion] (in Spanish). Racing de Santander. 14 August 2012. Retrieved 20 August 2012. ^ "Manolo, destituido como entrenador del Sporting" [Manolo, sacked as Sporting coach] (in Spanish). Sporting de Gijón. 18 October 2012. Archived from the original on 21 October 2012. Retrieved 18 October 2012. ^ "Sandoval, nuevo entrenador del Sporting" [Sandoval, new Sporting's coach] (in Spanish). Sporting de Gijón. 18 October 2012. Archived from the original on 5 October 2013. Retrieved 18 October 2012. ^ "Mandiá deja de ser técnico del Hércules" [Mandiá ceases to be Hércules' coach] (in Spanish). Marca. 22 October 2012. Retrieved 24 October 2012. ^ "Quique Hernández, presentado como nuevo entrenador" [Quique Hernández, presented as new coach] (in Spanish). Hércules CF. 22 October 2012. Archived from the original on 25 October 2012. Retrieved 24 October 2012. ^ "El Huesca cesa a Antonio Calderón" [Huesca dismisses Antonio Calderón] (in Spanish). LFP. 11 December 2012. Retrieved 25 December 2012. ^ "Ángel Royo toma el mando de los entrenamientos en la SD Huesca" [Ángel Royo takes command of training SD Huesca] (in Spanish). RadioHuesca.com. 11 December 2012. Retrieved 25 December 2012. ^ "Acuerdo entre el Racing y Fabri para la rescisión de su contrato" [Agreement between Racing and Fabri for cancellation of his contract] (in Spanish). Racing de Santander. 11 December 2012. Retrieved 11 December 2012. ^ "José Aurelio Gay es el elegido por el Racing para sustituir a Fabri en el banquillo" [José Aurelio Gay is chosen by Racing to replace Fabri on the bench] (in Spanish). El Diario Montañés. 12 December 2012. Retrieved 12 December 2012. ^ a b "Jorge D'Alessandro, nuevo entrenador de la SD Huesca" [Jorge D'Alessandro, new manager of SD Huesca] (in Spanish). Diario del Alto Aragón. 25 December 2012. Retrieved 25 December 2012. ^ "Julio Velázquez deja de ser entrenador del Villarreal CF" [Julio Velázquez does not continue as Villarreal coach] (in Spanish). Villarreal. 13 January 2013. Archived from the original on 16 January 2013. Retrieved 13 January 2013. ^ "Marcelino García Toral será el técnico del Villarreal CF" [Marcelino García Toral will be the manager of Villarreal CF] (in Spanish). Villarreal. 14 January 2013. Retrieved 14 January 2013. ^ "El Real Murcia destituye a Siviero y le sustituye con Onésimo" [Real Murcia sacks Siviero and substitutes him with Onésimo] (in Spanish). Marca. 4 February 2013. Retrieved 5 February 2013. ^ "Onésimo Sánchez: "El Real Murcia somos todos"" [Onésimo Sánchez: "Real Murcia are all"] (in Spanish). Real Murcia. 4 February 2013. Archived from the original on 12 April 2013. Retrieved 5 February 2013. ^ "Destitución de Esteban Vigo Benítez como entrenador de la primera plantilla" [Dismissals of Esteban Vigo Benítez as coach of first team] (in Spanish). Xerez. 18 February 2013. Archived from the original on 21 February 2013. Retrieved 21 February 2013. ^ "Carlos Ríos, nuevo entrenador del Xerez" [Carlos Ríos, new manager of Xerez] (in Spanish). Marca. 20 February 2013. Retrieved 21 February 2013. ^ "José Aurelio Gay deja de dirigir al primer equipo racinguista" [José Aurelio Gay ceases as Racing coach] (in Spanish). Racing de Santander. 5 March 2013. Retrieved 8 March 2013. ^ "Alejandro Menéndez, nuevo entrenador verdiblanco" [Alejandro Menéndez, new coach of the green-whites.] (in Spanish). Racing de Santander. 5 March 2013. Retrieved 8 March 2013. ^ a b "Juan Eduardo Esnáider sustituye a Rafael Berges en el banquillo del Córdoba" [Juan Eduardo Esnáider substitutes Rafael Berges in the Córdoba bench] (in Spanish). LFP. 9 April 2013. Retrieved 9 April 2013. ^ "La LFP comunica al Guadalajara su descenso". Marca.com. June 2013. Retrieved 4 June 2013. ^ "La LFP desestima el recurso del Guadalajara contra su descenso". As. June 2013. Retrieved 25 June 2013. ^ "El CEDD deniega la suspensión cautelar del descenso al Guadalajara" [CEDD denies precautionary suspension of the Guadalajara relegation] (in Spanish). Marca. 12 July 2013. Retrieved 17 July 2013. ^ "El Xerez desciende a la Tercera División (Xerez relegated to Tercera División)". Europa Press. August 2013. Retrieved 1 August 2013. ^ "Criterios de puntuación del juego limpio" [Fair Play score criteria] (in Spanish). RFEF. 30 October 1998. Archived from the original on 7 April 2010. Retrieved 15 May 2011. ^ "Clasificación final del Premio Juego Limpio" (in Spanish). RFEF. 13 June 2013. Archived from the original on 17 June 2013. Retrieved 16 June 2013. This page was last edited on 21 March 2019, at 01:19 (UTC).